I read about the Ramp-fest and now I'm craving ramps. Does anyone know of a Chicago grocery/market that has them reliably? I'd like to know this as well...particularly where to find ramps in the northern suburbs. They’re available via mail order, but they ain’t cheap. Over the past two years I've had no difficulty finding them at various Whole Foods around the city, once they're in season. I'm certain I've bought them at the Whole Foods on Dearborn and also at the one on Ashland. I'm assuming ramps are rampion. When I was a child I had Shirley Temple's storybook. In it, adapted from the Brothers Grimm was the story of Rapunzel.......who was standing by this window and looking down into the garden, when she saw a bed which was planted with the most beautiful rampion - rapunzel, and it looked so fresh and green that she longed for it, and had the greatest desire to eat some. The desire for rampion increased every day, and as she knew that she could not get any of it, she quite pined away, and began to look pale and miserable. Her husband was alarmed, and asked, what ails you, dear wife. She replied, if I can't eat some of the rampion, which is in the garden behind our house, I shall die.......well you know the rest. The book was illustrated with the most enchanting picture of this witch that imprisioned Rapunzel after she ate the rampion and was caught. At that point, and for many years later I had no idea what Rampion was. Better get the ramps in a store lest you be locked in a tower by a witch!!! MrBarossa wrote: Over the past two years I've had no difficulty finding them at various Whole Foods around the city, once they're in season. arrrrgggghhh! I wonder how many times I've walked past them in the last few years? I wouldn't be surprised if they lept out of the display and slapped me in the face, and I brushed them off, staring at my grocery list... Doh! toria wrote: I'm assuming ramps are rampion. When I was a child I had Shirley Temple's storybook. In it, adapted from the Brothers Grimm was the story of Rapunzel.......who was standing by this window and looking down into the garden, when she saw a bed which was planted with the most beautiful rampion - rapunzel, and it looked so fresh and green that she longed for it, and had the greatest desire to eat some. The desire for rampion increased every day, and as she knew that she could not get any of it, she quite pined away, and began to look pale and miserable. Her husband was alarmed, and asked, what ails you, dear wife. She replied, if I can't eat some of the rampion, which is in the garden behind our house, I shall die.......well you know the rest. No ramps at the Lincoln Park Whole Foods this Saturday; the produce guy explained that they had some last week, but they went fast. I picked up a bag of reassuringly dirty ramps from Green Grocer on Grand for something like $11/lb. 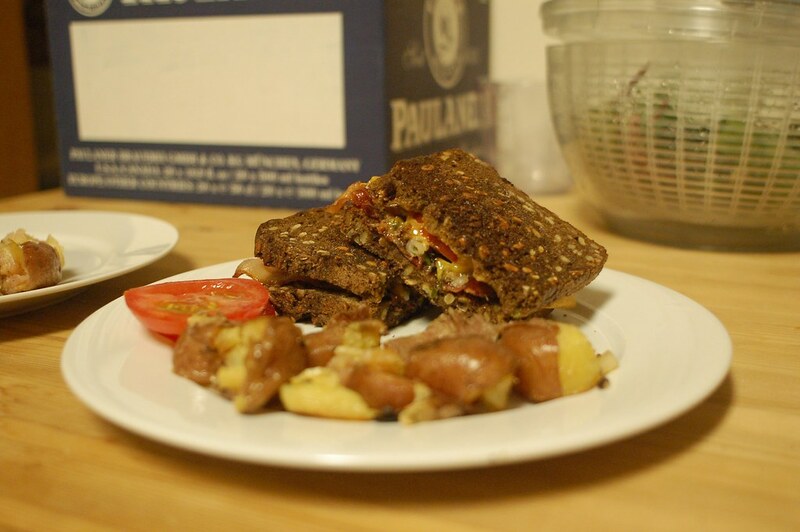 This sandwich is sharp cheddar, bacon, ramps and scallions cooked in the bacon fat, and sliced tomatoes on dark rye and sunflower seeds, also from Green Grocer. It was an amazing sandwich. Drat. Green Grocer was out last night. But she thought she should be getting more in, so I'll give her a call later this week. The plus side was that I got to taste several flavors from "Nice Cream", and went home with a pint of Cream Cheese/Carrot Cake locally made ice cream! My ramps just arrived from Irv and Shelly's Fresh Picks a few moments ago. Suggestions for preparation. I have never prepared them before and DH wanted them. Cassie at Green Grocer very kindly volunteered to put me on an email alert list: all you need to do is give her a call and get her email address. Just spoke w/Green Grocer. They said they didn't get them in because their farmer said they were starting to get bitter. May be end of the season. Jazzfood wrote: Just spoke w/Green Grocer. They said they didn't get them in because their farmer said they were starting to get bitter. May be end of the season. I hope the season's not over, and it would seem odd to me if it were. It's been a relatively cool/late start to Spring this year, and last year I was making ramp soup on May 4. Ramps just starting to sprout in the Chicago area. Louisa Chu wrote: Ramps just starting to sprout in the Chicago area. Louisa, I "won" the bid for the box of vegetables at Lockwood's Digital Tasting, and it arrived yesterday. It was $60, but wow, what a haul. About 2 pounds of Meyer lemons, similar quantity of Purple Haze and finger-sized orange carrots, nice bunch of mini potatoes, two hefty cartons of microgreens, beautiful red rhubarb, some other stuff I'm not remembering...and a large bag of ramps. FedEx'd. Aren't these ramps? They're a good bit smaller than I expected (a little smaller than scallions but bigger than chives, and a good bit shorter, that's a sandwich-size clamshell,) but with that tulip-shaped leaf, they look spot-on the other pictures posted here. 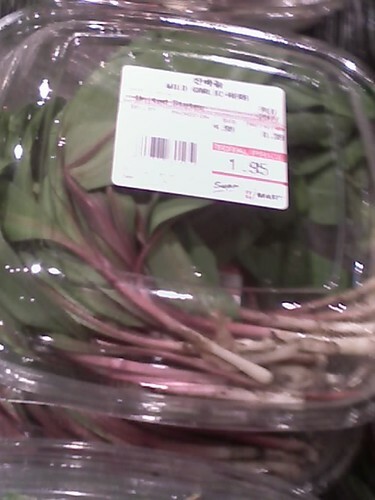 They also had a different, similarly-packaged item labeled "wild garlic," but that looked more like chives, which I guess are similar to what stevez found. They look like ramps to me. But chives have round leaves; Steve's stuff in his backyard look identical to the garlic in my backyard. Mhays wrote: Aren't these ramps? The other "wild garlic" stuff looked like chives but with flat leaves, so that's probably it. Have I mentioned that I love H-Mart? Nice dirt on the roots, too. And Cassie at Green Grocer was awfully nice, too. Mhays wrote: Have I mentioned that I love H-Mart? Great score, Mhays, I hope you bought a lot of that awfully inexpensive "wild garlic." H-Mart is very lovable that way! 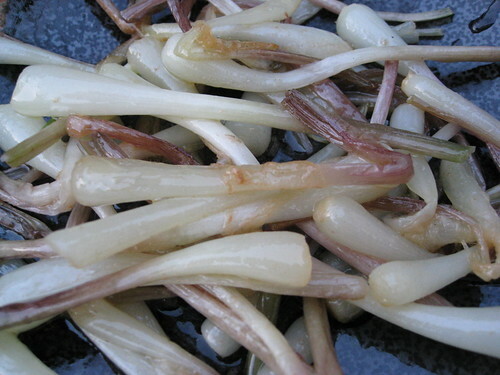 Turns out, that excellent Chef’s Garden in Milan, Ohio, sent me about two pounds of ramps. So I cooked some in butter for The Wife (she worked hard all day). 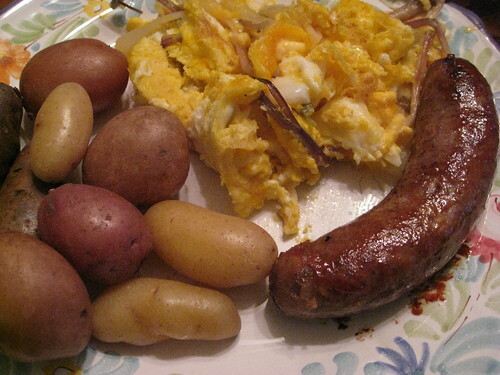 I rolled them into some Genesis Growers eggs and served them with a Mulefoot Bratwurst, which was very dense and surprisingly well-spiced, alongside a bevy of colorful spuds, also from Chef’s Garden; she liked them. I found the purple potatoes way too starchy, but the others were perfect: sweet, soft, actually kind of juicy. Those flowers are cute, aren't they? The cukes were too (actually, more cute than flavorful, but that's okay; cute food counts for something). Outside, for the last three days, this odd bird has been eating my grass seed. Any ornithologists care to speculate about its identity? People walk by, see this bird, and stare. It’s an oddity. It’s white and beautiful. I walk so close to it, I could grab it by the neck (which has occurred to me, as it’s eating my grass seed). It has no survival skills. I think it’s a pet that escaped. What kind of bird is this? Your wife is a lucky gal, care to give Mr. Ursi cooking lessons? 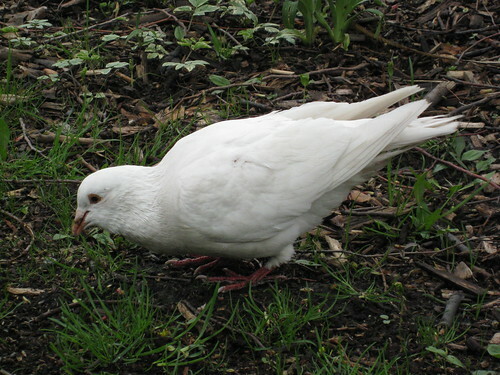 It looks as if you have an all white mourning dove there. They aren't common, but they do occur from time to time. Of course, my bird books (along with the rest of my books) are still packed up, so I can't be certain. David Hammond wrote: People walk by, see this bird, and stare. It’s an oddity. It’s white and beautiful. I walk so close to it, I could grab it by the neck (which has occurred to me, as it’s eating my grass seed). It has no survival skills. I think it’s a pet that escaped. What kind of bird is this? 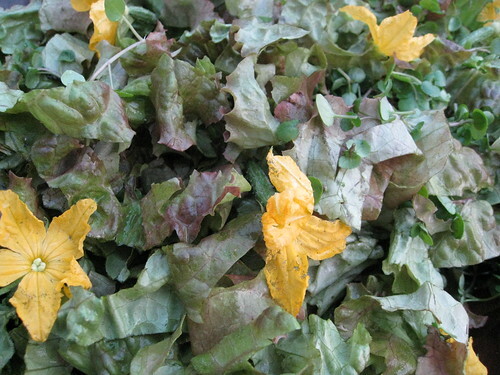 Whatever it is, I suspect it would be nice if it were pan-roasted and served atop that red-leaf salad of yours. Ursiform wrote: It looks as if you have an all white mourning dove there. They aren't common, but they do occur from time to time. This big white bird does bear some resemblance to mourning doves, and we do have a lot of the more common iridescent grey-burgundy mourning doves, so could be. But this is one large bird, and I have never seen it with any other birds. The wing structure is similar...but have you ever seen a mourning dove with yellow eyes? Argh - I can't get to my books! You might e-mail these fine folks, they have a specialist to whom you can e-mail pictures of odd birds. The link is on the first page. I'm very curious, please post the results if you find out! Yes, this ornithological line of questioning might seem tangential to food talk, but I may just take eatchicago's suggestion and bag this bird for dinner. Maybe. Dove season opens soon. Get your free permit online mid-May. Louisa Chu wrote: Dove season opens soon. Get your free permit online mid-May. Really, there is a Dove season? I guess it makes sense if you think about it, but since doves mate for life, it never would have occurred to me that people would want to hunt them. Intentional naivete on my part, I guess.